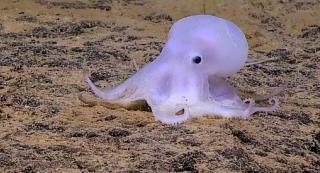 (Newser) – NOAA scientists exploring the ocean depths off the coast of Hawaii may have just discovered a new species of octopus, and boy is it adorable. Gizmodo describes the tiny creature as something out of Pixar or Pokemon, while a NOAA blog post calls it ghostlike. But a scientist overheard on a video of the cephalopod may have summed it up best: "Beautiful." In addition to looking super cool, the creature is believed to be the deepest finless octopus ever seen, Forbes reports. NOAA's remotely operated vehicle Deep Discoverer was hunting for geologic samples on Feb. 27 when it spotted the octopus on a rock more than two-and-a-half miles below the surface. Next on Newser: Is the World's Most Prolific Crossword Maker a Plagiarist? Rumor has it a dentist in the area has taken up deep sea diving and spear gun training.